This post is only the preview for the week-end... There is another post at isTia with actual pictures from Clash At Clairemont V 2011. Hey you! Mark your calendar right now! Clash at Clairemont is back and the energy level is up to the Vth power. 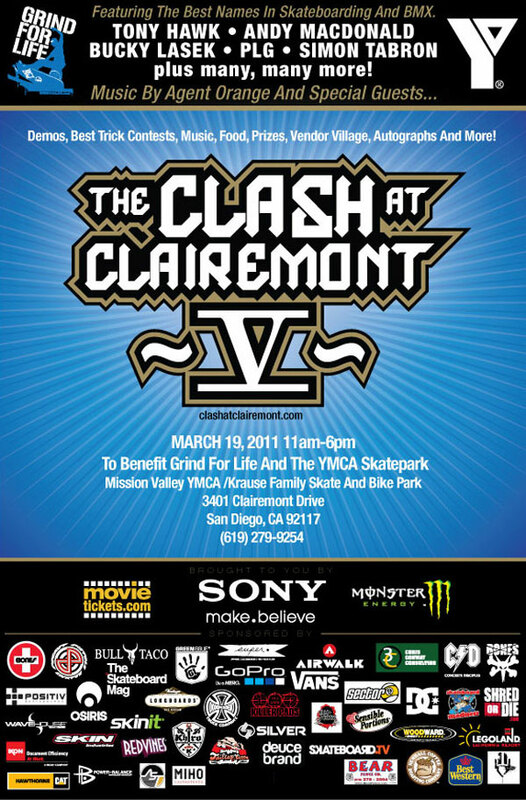 Clash at Clairemont V finally returns to San Diego on March 19th 2011, that is this coming week-end. San Diego’s premiere Action Sports fundraiser features the best names in Skateboarding and BMX, with live music, great food and an interactive Vendor Village. The Proceeds will benefit the Mission Valley YMCA/Krause Family Bike and Skate Park and Grind for Life “Helping People with Cancer”. Who will be appearing? Not just your regular Tony Hawk himself (Tony's Mom's 85th bday party is that night... but you're not invited to that)but Andy MacDonald, Bucky Lasek, PLG, Adam Taylor, Simon Trabon and more, plus performances by Agent Orange (the storied punk band that played the first Clash in 2007) and other bands will perform after the bowl jam. Clash at Clairemont typically get 60-80 of the best skateboarders and BMX professionals and even sponsored amateurs. So, amateur street types, don't forget the Skateboard Mag $500 winner take all best trick contest Saturday March 19th at Clash at Clairemont V and enroll right now with Laszlo Kelemen (lkelemen@ymca.org). Last year, there was a highest 540 contest and Lincoln Ueda took it. 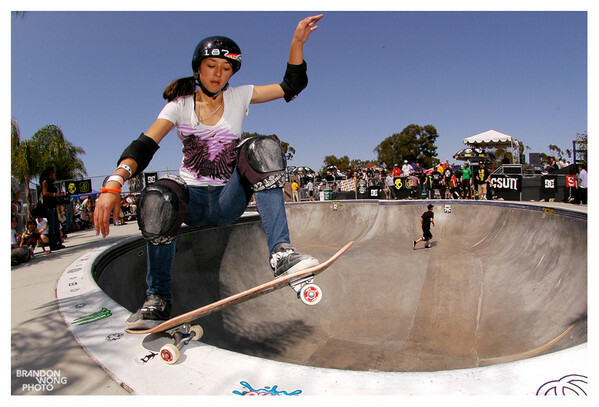 Lyn-Z Hawkins, Bucky Lasek, Duane Peters, Allysha Bergado, Shane Allen, Tony Hawk, Lizzie Armanto, David Hackett, Josh Borden, Buddy Carr, Julie Kindstrand and of course Mike Rogers were there and they are expected to be here this year too. 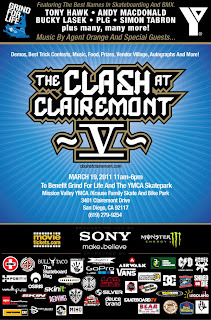 ﻿In its fifth (V) year already, The Clash at Clairemont began in 2007 as a cooperative effort between Pro Skateboarder Andy Macdonald, the Mission Valley YMCA / Krause Family Skate and Bike Park, Grind for Life and Industry Sponsors like Pacsun and SoBe beverages. The first year’s event unveiled the new Vert Ramp (The 2006 X-games Vert ramp re-constructed on the grounds of the YMCA skatepark). The event, a celebration of the newly acquired ramp and park renovations was an opportunity to create a fundraiser that benefits the Mission Valley/Krause Family Bike and Skatepark and the Grind for Life Cancer charity. Between 2008-2010 The Clash at Clairemont II to IV returned with resounding success. With the very best athletes from skateboarding and BMX along with terrific musical acts and industry sponsor support a classic annual event was born. Media attention and attendance skyrocketed and now the Clash at Clairemont has cemented its first class reputation as a terrific family oriented celebration of Action Sports and charitable cause! Grind For Life, Inc was founded in 2003, by life-long skateboarder Mike Rogers, after his second battle with sarcoma cancer. Mike’s tumor was located behind his right eye and nasal cavity. He endured a 17 hour surgery a cranial-facial resection with a brain-lift, removal of his eye, cheekbone, half of the roof of his mouth and several teeth. He beat cancer once as a pre-teen, and again 25 years later. Grind For Life and the Clash at Clairemont is Rogers' attempt to allay a portion of the steep costs that cancer patients incur. "The Clash is a great tool that we use to help people when they're traveling out of state for cancer care or long distances," Rogers explained. He utilized connections in the skateboard industry to convince other pros to participate and deliver exposure. "We have the pros come in and we've been able to help a lot of people get to their doctors who otherwise wouldn't be able to." Both Mike Rogers and Andy Macdonald, another on Grind for Life's Board of Directors, emphasized the importance of -- and their gratitude for -- the skaters participating pro bono. Without it, the amount of prize money they regularly earn could hinder the effectiveness of the Clash. Macdonald argues that the gathering has been "arguably the biggest, best demo" given the prestige of the pros in attendance. "It helps saves people’s lives," Rogers claimed. "What better way to do it than through skateboarding?" So again, mark your calendar! Entrance fee is only $10, the goal this year is to reach $20,000 in donations at the gate and it will be for the benefits of the Mission Valley YMCA/Krause Family Bike and Skate Park and Grind for Life “Helping People with Cancer”.